Last year, I was hired by a gentleman who was five years behind on processing all the paper that comes to his residence: everything from receipts and statements to correspondence to printed-out e-mails to Christmas cards. I spent about 30 hours getting this aspect of his life organized, much to his delight. Six boxes to the professional shredding company. Later in the year I met someone else who was falling behind as well, stymied by the design of her shredder. In order to empty it, she had to lift the heavy mechanism to get at the shredded paper below. Her dilemma was really in her lack of hand-strength. 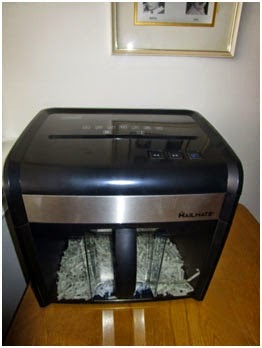 To her delight I was able to find a shredder for her with a radically-different design: you see that black handle in front of the shredded paper - the light-weight plastic drawer pulls out easily when it is time to empty it. In modern parlance, I guess this would be a “shout-out” to Staples for their “MailMate” shredder! p.s. My big trick at home, managing paper, is to hide it in a basket below a kitchen counter, so I don’t have to look at it. I know it’s there, when I feel up to it, but it doesn’t stare at me every day!